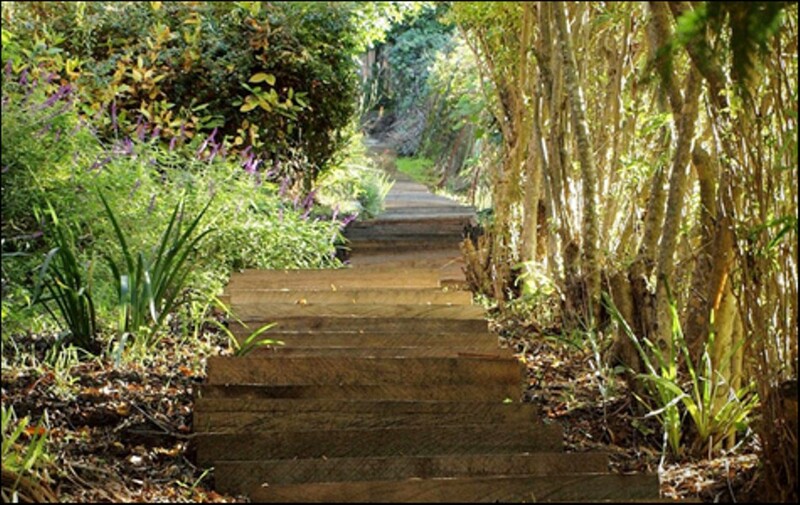 A Berkeley group eschews hiking trails for the beauty of paved paths. The Berkeley hills are a treasure trove of seemingly secret pathways, barely visible when zooming up and down in a car but revealed to pedestrians making their way through the dense network of winding roads. These cracked stairways, jasmine-shrouded paths, and the occasional overgrown narrow trail serve as pedestrian shortcuts through the hills. They offer many of the same sights and smells as Berkeley's tree-lined residential streets, but in miniature, with no cars, and often with spectacular views of both the bay and the cozy backyards of houses on the hill. The walkways were mostly carved out in the early 1900s, when Berkeley wasn't much more than a rural outpost put on the map because of its proximity to the burgeoning metropolis of San Francisco. The 1906 earthquake, however, sent many refugees fleeing to the wilds of the East Bay. Developers bought up chunks of land in the undeveloped Berkeley hills and began building the spindly roads that would crisscross the residential slopes. But the streets were long and unwieldy, offering no easy shortcuts for walkers needing to access the streetcar stops dotted throughout the hills. Hence the paths. A century later, the hodgepodge of volunteers who make up the Berkeley Path Wanderers Association have devoted countless weekends to meandering and mapping Berkeley's elaborate network of more than 130 paths. The group hosts at least two walks a month, sometimes led by experts on local architecture or featuring poetry readings; but more often than not, the main focus is simply the paths themselves. "People walk a lot more now than they did twenty years ago," said Glen Lindwall, who will be leading a special Stepping in to the New Year walk along the Berkeley-Kensington border on New Year's Day. "There was a period back in the Fifties and Sixties when people didn't walk — they'd just hop in their cars and be done with it! I think we appreciate walking now more than we used to." 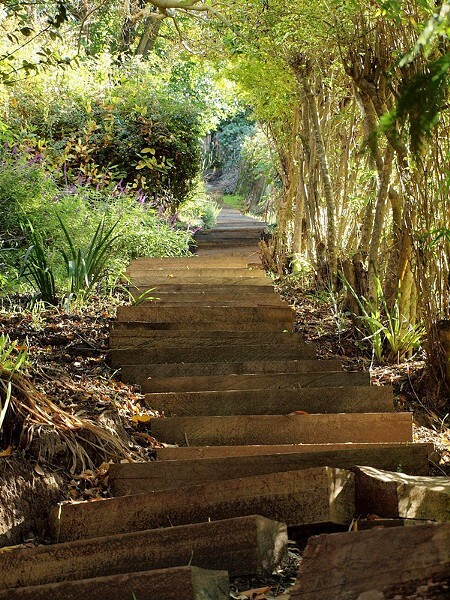 Now entering its fifteenth year, the Berkeley Path Wanderers Association also dedicates much of its energy to preserving the paths its members so cherish. "When the Path Wanderers first started, there were at least fifty paths that had either never been fully developed or were totally overgrown," said Lindwall. "Since then, we've actually managed to open up around thirty of them." Earlier this year, member Charlie Bowen was honored by the Cox Conserves Heroes program for her efforts to restore Berkeley's hilly walkways; she donated the $10,000 prize back to the association.